The thousands of people seeking asylum in the United States deserve our solidarity, not our military, writes Mohammed Harun Arsalai for mainstream media outler The New Arab. Originally published by The New Arab. Writen by Mohammed Harun Arsalai. Image above by @cincodobleu. As the dust settles on the US midterm elections, the Trump administration continues to stoke fear and anger among its supporters of a looming “invasion” by a so-called migrant caravan, a “concern” which the Democratic Party had dismissed as an electoral ploy. It has become abundantly clear that the law simply does not apply or matter to the Trump administration. This past week we’ve seen Trump declare his disdain for both the US constitution as well as the Geneva conventions in regards to fundamental human rights of refugees. Thousands of troops are being sent to the US-Mexico border to illegally block the entry of refugees seeking asylum. They are being sent under the guise of an emergency and a supposed threat to national security, with the green-light to shoot refugees who may throw rocks. The president’s calls to “defend the border” have galvanised white supremacists and right wing militias from throughout the country. If refugee solidarity activists and advocates want to stop the Trump administration from caging indefinitely and inflicting further violence on the refugees headed for the US-Mexico border, some insight can be found by exploring the European Union’s rapidly growing anti-immigrant fascism, as well as the ongoing resistance to it. In Europe, there has been a calculated and organized transnational collaboration between FRONTEX, the EU’s border patrol agency, with far-right politicians, activists and extremists throughout the EU. And similar cooperation is developing inside the US. This past week Michael Hansen, a Danish-born far-right documentary maker and director of the Islamophobic and anti-Black Killing Europe, released a new video titled Killing Free Speech which was endorsed by none other than the National Border Patrol Council (NBPC). It showcases Border Patrol agents as well as members of fascist street gang The Proud Boys. The video reveals a connection between not only the rhetoric used in the EU to demonise refugees, but shows a direct connection between the strategies and tactics employed by far-right state and non-state actors within the EU and the US. The rhetoric being used by the far-right and Border Patrol in the US is intertwined and interchangeable with FRONTEX and the European far-right. The two play off each other and directly collaborate. There are approximately 20,000 active Border Patrol agents and The National Border Patrol Council, which signed on to endorse the video, represents at least 90 percent of them. Similar to the propaganda that swept through the EU with the echoing of FRONTEX talking points in recent years, Hansen seeks to amplify the Border Patrol’s far-right rhetoric with the American public. In a press release, the NBPC claimed the video was a “powerful spotlight on the terrifying assault on liberty in America today. A country heading down the road toward Orwellian control of information by a small but powerful cabal”. In the EU, far-right politicians, much like Trump, began by vilifying the refugees as “invaders” as they played up anti-Muslim sentiments. Once the far-right had adequately demonised the refugees in the public psyche, they went after solidarity activists with a campaign of misinformation about the NGOs who engaged in search and rescue missions in the Mediterranean Sea. A leaked memo from FRONTEX claiming NGO workers were working in collusion with smugglers was picked up by far-right parliamentarians as well as well far-right activists. It led to an anti-refugee bigot- Matteo Salvini – taking control of Italy, gliding into office on a fascistic platform based on anti-immigration rhetoric that unified all fragments of the right and far-right. Salvini has used his power to push for further militarisation of the Mediterranean Sea, where at least 1,987 people have lost their lives so far this year. Inside Italy, Salvini called for the “clearing the streets of filth” – in reference to those who survived the arduous journey from deep within Africa through the slavery being conducted in Libya and the armed boats in the Mediterranean Sea gifted to Libyan militias by Italy and the EU to stop refugees from making it to Italian shores. Europe has outsourced its military options to places such as Libya and Turkey, not got rid of them. 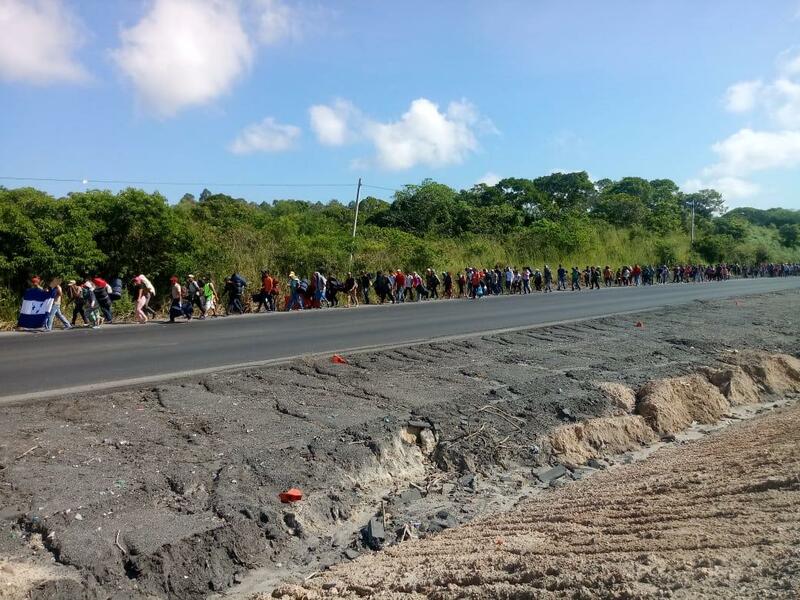 In a recent article, Stop Saying ‘Migrant Caravan’: They’re Asylum Seekers Escaping a Conflict That the US Created, Kelli Korducki, intersectional feminist and senior news editor at Brit+Co, correctly argues that those seeking refuge who are headed for the US-Mexico border should not be called “migrants”, but should be referred to as “asylum seekers” who are seeking refuge, or “refugees” – an important distinction which needs to made so there is no room for confusion regarding the 1951 Geneva Convention regarding the rights of those making their way to the US. Being labelled a “migrant” instead of “refugee” can be a matter of life or death. The US as well as the EU use this change in terminology to deny would-be refugees their right to asylum on a daily basis. A prime example of this was articulated in the Joint Way Forward agreement between the EU and Afghan government in 2016 – a deal which was widely condemned as forced upon the Afghan government by the threat of withheld international aid monies. In the deal, Afghans were demoted from “refugee” to “migrant”, which allowed for the EU to circumvent international laws regarding the rights of refugees. The change in narrative allowed for a disregard of restrictions on EU deportations. Quick and easy rejections of asylum cases not just of Afghans, but of Somalis, Eritreans, Nigerians and others has now become standard. The far-right uses Islamophobic tropes and slanders, depicting the refugees as “Muslim invaders” and “rapists”; far-right politicians also used this rhetoric to gain power across the European continent. Maintaining that those currently heading to the US are refugees instead of migrants is an important definition to uphold, but this can not mean the demonisation of others who fall into the category of “economic” or “environmental” migrants. Even in such cases, much of the devastation forcing displacement starts with a violent process. It’s gravely important that refugees and their supporters recognise what has happened over the past five years in Europe to understand what’s coming for them as they approach the United States. Defences in language need to be built: these are not simply economic migrants, these are refugees. But we need to stop thinking of this as a “refugee crisis” for western states, and understand this as a political struggle – this is “the refugee struggle”. These narratives matter. As much as we need to learn from the tactics used by the far-right in the EU to defend ourselves against violence and state repression, we need to take a close look at what worked and what didn’t in regards to our approach at direct solidarity. Refugees have shown they have the capacity to engage in confrontation; they have been jailed, beaten, extorted, robbed of dignity and even their children. They have taken to hunger strikes, direct actions and have broken through military and police barricades as seen at the Greece-Macedonia border in 2015. They had the world’s support for about two years – until the world got bored of the iconic pictures of dead children washing ashore on European beaches. Refugee detention centres in Greece have been overpopulated since at least the 1990s, but were only liberated by the sheer mass of refugees flooding out of Syria. The Syrian revolution did more to save the lives of these refugees stuck in captivity than any organisation or “No Borders” campaign in the past three decades. The solidarity actions as well as volunteer aid work were massive in 2015 and 2016, but also dissipated unsurprisingly with the media consumption cycle. The media milked the situation before moving on – and so did the majority of the volunteer tourists who arrived to take selfies. Those who stuck around for the long haul are currently engaged in an assortment of strategies to support the refugees who are stuck on various island prisons as well as for those who made it to the Greek mainland. Squats, legal aid, mental health support and other work continues to be pushed to its limits. One of the most important projects taking place is Athens is City Plaza (Warning Facebook Link), the squatted hotel that doubles as a leftist social centre. Those living inside the hotel/social centre organise the hotel themselves and engage in regular demonstrations in regards to refugee rights and anti-racism. Once refugees arrive or are released from detention if they are not deported, they will need emergency support that should not be left only to massive NGOs like the Red Cross, but which need to picked up by refugee solidarity networks. But the first thing that needs to happen is for US-based activists to engage local organisations along the border and call for No Borders-styled mobilisations to confront the US government head-on. Trump’s deployment of armed troops to the border has shown us quite clearly he will imprison families seeking refuge – or even engage in violent operations to stop them. Trump and the US government are in flagrant violation of international laws regarding the rights of refugees. So action needs to be taken without regard to US laws or borders. Mohammed Harun Arsalai is an independent journalist and political activist from the Bay Area of California, and co-founder of the independent media project, Documenting Afghanistan (Warning Facebook Link). Currently based in his native Afghanistan, Mohammed’s recent work focuses on refugees, the War on Terror and militant groups operating inside Afghanistan. Opinions expressed in this article remain those of the author and do not necessarily represent those of Enough is Enough and The New Arab, its editorial board or staff.